The Great Places to Work Foundation just published this year’s list of the 50 small and medium-sized organization that are great places to work. See any school districts on this list? This is a missed opportunity for smaller school districts. To my knowledge no school district has ever been on the list. This is a goal worth pursuing. Anyone want to step up? My ancestors worked with their hands. They loved making things. For better or worse, I have inherited that gene. I have been a draftsman, a farmer, a carpenter and one day perhaps even a potter again. My grandfather, Henry, worked at the Crane and Breed Company in Cincinnati, Ohio as a wood carver. 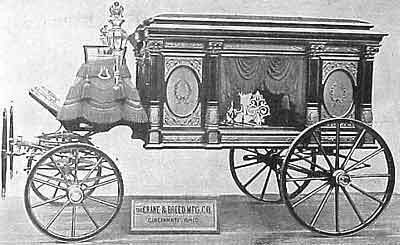 This is the kind of work he used to do – hearses and caskets. After he retired, I remember him working daily at his tool bench in the basement making or improving one household item or another until he was satisfied. I often wonder what he would be improving, if he were still alive. I suspect he would be using an i-pad and a 3-D printer to do it. Like you, students need to find nurturing places in real life and on the web to geek out with others who share their passion. They’ll thrive in spaces that perpetually rekindle their desire to make meaningful contributions toward personally relevant issues, ideas, people and interests. Education in search of relevance to students. Now there’s a radical idea! This is why when we start a design session we ask each participant to generate at least ten solutions. Number one is never perfect. Number ten is better. Zolli in Resilience talks about hybrids as being the way to avoid catastrophic system failure (unless they change, all systems fail). Taking the best of solution number one and solution number ten and combining them gets us closer to amazing. Parent participation in school improvement.